Please click on one of our frequently asked questions for an answer. If you have a question which isn’t listed please email us for an answer. Q: Will you copy a design I like from a photograph? Q. Are the flower decorations handmade? A: The Cake Studio’s decorated flowers are all handmade and are a beautiful keepsake of your wedding day or special occasion. Q. Do you supply Gluten Free cakes? A: Yes, Gluten Free cakes can be made on request. Q. What flavours and fillings are available? Q. How far in advance do I need to order my occasion cake? A: For celebration cakes we require 2 weeks notice, however we will always try to accommodate orders at shorter notice. Q. Can you deliver my cake? 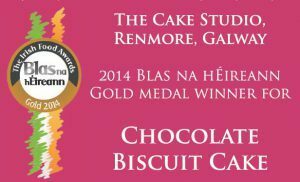 A: Yes, delivery within the Galway area is available for all our celebration cakes, a delivery charge will apply for cakes outside of the Galway area. Q: How much should I expect to pay for a cake? Q. How many portions are in a cake? A: Portion numbers depend on the cake size and shape; please remember the hotel will portion the cake on the day so we will liaise with the hotel co-ordinator beforehand to ensure the cake is portioned to your satisfaction. The following is a guide to the min/max portions per cake. Q. Can you incorporate the colours used in my wedding into my cake? A: Yes, the colours used in the bridal wear can be replicated in the cake, the bridal flowers can also be replicated in the form of iced handmade flowers. Q. Can I use fresh flowers on my cake? A: Yes, however, to ensure they match perfectly with your wedding flowers, it’s advisable to source fresh flowers for your cake from the same florist. Q. Do I have to choose a cake from your gallery? A: All the cakes on the Cake Studio’s gallery are available and we look forward to working with the bride and groom in creating a unique and unforgettable cake design for their special day. Q. How far in advance do I need to order my wedding cake, how do I secure my date? A: We require 3 months notice for wedding cakes, however if possible we will always try to accommodate orders at shorter notice. A: A deposit is taken to secure your date and payment in full is due 1 week prior to the wedding. Q. What is the Delivery and Cake Setup process? A: If delivery is requested, the cake is delivered to the venue on the morning of the wedding. It is setup on the table/stand provided and made photograph ready. A delivery charge is applied for venues located more than 30 km outside of Galway city. Q. Do I need to return the cake stand and base? A: Yes, stands, plates, pillars, etc. are provided to complete the look of the cake and these items should be returned within 5 days of the event.